Go toe-to-toe with greats such as Ali, De La Hoya, Joe Frazier, Bernard Hopkins and Roy Jones. Outside of the ring, gamers can establish intense rivalries through pre-fight events putting purpose and passion behind every hit. 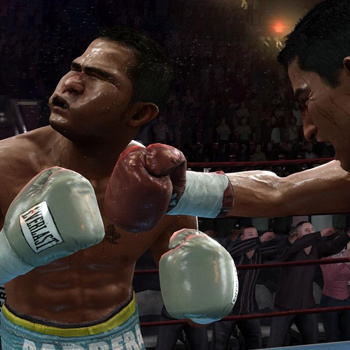 Three new Impact Punches a la the EA Sports Haymaker keep gamers at the edge of their seat as players are only one punch away from the entire dynamic of the fight changing. Land a perfectly timed Flash KO or jump into a quick mid-fight mini-game to land a humiliating knockdown punch. Thrown using EA Sports Fight Night's innovative analog punch system, Impact Punches are high risk and high reward - put down your opponent or get knocked on the canvas. Boxing's Greatest Rivalries - Watch ESPN Classic footage of real-life bouts or re-create the greatest fights from past and present including Arturo Gatti vs. Mickey Ward, Marco Antonio Barrera vs. Eric Morales, and Ali vs. Frasier. Establish intense rivalries of your own by intimidating opponents before the big fight with heated press conferences full of hype, trash talkin', and fights at weigh-ins. Relive the best rivalries of your career in ESPN's Instant Classics! Create a style of your own, then see how you match up against the authentic signature styles from the world's best fighters. Licensed boxers use tactics and strategies that match their real life counterparts.